In modern society, the healing of chronic wounds is still a major cause of discomfort for the patients and a financial burden for the care system. Current approaches use either organic tissue-engineered skin substitutes or stem cells based therapy. It has been shown that mesenchymal stem cells (MSCs) are able to improve the wound healing process by secreting factors with anti-inflammatory, anti-fibrotic and pro-angiogenic activities either as soluble molecules (growth factors, cytokines) or encapsulated within membrane vesicles (microparticles, exosomes). It has been shown that exosomes, the small membrane vesicles originating from the endocytic pathway, are the main mediators of MSCs paracrine effect. Their complex cargo (mRNA, microRNA and various anti-apoptotic and pro-angiogenic factors) has been found to induce migration and proliferation of fibroblasts as well as collagen synthesis. Thus, the combination of MSCs derived exosomes and organic biomaterials in order to enhance the healing process represents a novel approach for chronic wounds therapy, involving a cell-free use of MSCs paracrine activity. Uterine leiomyomas, also known as uterine fibroids (UFs), are benign smooth muscle cells tumors, the most frequent tumors in women. Even though UFs are monoclonal tumors, they contain a heterogeneous and versatile cells population. There are scarce proofs about the processes of transdifferentiation that might occur in UFs, modify the tumor microenvironment and support blood and lymph vessels formation. The stromal niches of the UFs harbor cells with angiogenic/lymphangiogenic, as well as with vasculogenic/lymphvasculogenic potential, which belong to a phenotypic continuum between the endothelial and mesenchymal lineages. Within these niches, the expressions of CD44 and podoplanin were less investigated and regarded as markers of such processes of transdifferentiation. Neuroendocrine neoplasms (NENs) of the digestive system are composed of cells with a neuroendocrine phenotype. These tumors produce and secrete peptide hormones and biogenic amines and they are called neuroendocrine neoplasms because of the marker proteins that they share with the neural cell system. The classification and nomenclature used to designate NENs have undergone changes over the past decades due to the accumulation of evidence related to the biological characteristics and their evolution. The European Neuroendocrine Tumor Society (ENETS) proposed a classification system based on the tumor grading and staging according to their localization. The latest internationally recognized NEN classification was published by the World Health Organization (WHO) in 2010. In accordance with the 2010 WHO criteria, the determination of the NEN malignancy potential is based on grading, depending on the mitotic activity and the Ki67 proliferation index, as well as on the tumor TNM stage. It is worth emphasizing that the terms neuroendocrine tumor (NET) and neuroendocrine carcinoma (NEC), without reference to grading or differentiation, are inadequate for prognostic assessment or the therapy determination, being inappropriate in pathology reports. The functional status of the tumor is based on the clinical findings but not on the pathological data or immunohistochemically profile. Despite the inability to establish a single system of sites, these are common features to establish the basis of most systems, documentation of these features allowing for greater reliability in the pathology reporting of these neoplasms. Giant cell granulomas in the oral cavity are reactive hyperplastic lesions that arise either peripherally in the mucoperiosteum or centrally in the bone. The peripheral giant cell granuloma (PGCG) is a benign lesion induced by local chronic irritation. It may develop at any age, and tends to be more frequent in females. Central giant cell granuloma (CGCG) is a reactive lesion of unknown etiology. It commonly occurs in children and young adults. It is also predominant in females and frequently located in the anterior part of the mandible. Histologically, PGCG and CGCG have similar features. The lesions are non-encapsulated proliferations of oval and spindle-shaped mononuclear cells (MCs) and multiple multinucleated giant cells (MGCs) in a vascular supporting stromal tissue, associated with foci of hemorrhage. Despite the similar microscopic features, PGCG and CGCG have different clinical behavior. PGCG is usually reduced in size and asymptomatic. It grows locally, as an exophytic lesion on the alveolar mucosa, but may become slightly infiltrative in the underlying periosteum and bone. After complete excision and curettage, it has a low recurrence rate. Contrarily, CGCG has an aggressive behavior, with rapid growth and intense osteolytic activity causing perforation of the cortical plate, teeth malposition and pain. Moreover, it is characterized by a high recurrence rate. This review focuses on the origin and activating pathways of MCs and MGCs, discusses the mechanisms underlying their biological activity, tries to explain the variable clinical behavior and proposes therapeutic approaches for the granulomas associated with the jaw bones. Ledderhose disease or plantar fibromatosis is a rare hyperproliferative disorder of the plantar aponeurosis, clinically characterized by nodules situated especially on the medial border of the foot. It is histopathologically associated with Dupuytren s disease. This disease has some risk factors, like old age, alcohol or nicotine abuse, liver dysfunction, trauma or exposure to vibrations and autoimmune disorders, but the exact etiology is still unknown. Even though it is benign, the local manifestations can be aggressive, leading to debilitating deformities and contractures of the toes. Ultrasound and magnetic resonance imaging are used to confirm the diagnosis and to eliminate other disorders. Whenever is possible, the conservative therapies are recommended. Having a high recurrence, Ledderhose disease can be hard to treat, needing multiple surgical interventions. This paper aims to cover all the important aspects of this disease for daily medical practice, from history to clinical manifestations, diagnostic methods and histopathological features, to conservative and surgical treatment modalities. Diabetes mellitus is the leading cause of non-traumatic amputations worldwide. Ulcer of the diabetic foot is one of the most prevalent lesions of diabetic patients and it occurs in the natural evolution of the disease as a tardive complication. Neuropathy is the main determinant of foot ulcer. A key role is played by the loss of sensitive nerves, which prove to be a protective barrier against high pressure applied otherwise on the foot. The morphopathological characteristics of neuropathic lesions in patients with diabetes show important improvement associated with the pressure relieving treatment strategies. Therefore, pressure seems to impose a continuous mechanical stress on the wounded foot and it also sustains a chronic inflammatory condition, which slows down the healing process. Atherosclerosis is an imminent process to every person, nonetheless patients with diabetes mellitus have this process highly accelerated and more diffuse. One of the main characteristics of macrovascular lesions in diabetes is Monckeberg s medial calcific sclerosis, calcification of the muscular layer, which clinically translates into an ankle-brachial index of 1 or above. Diabetes affects not only the large vessels, but it also produces microvascular lesions, which in time leads to diseases like retinopathy or nephropathy. Osteomyelitis is very common in the diabetic foot infections and the medical treatments are not satisfying. It is also believed to be a consequence of peripheral neuropathy that diabetes comes with. Osteomyelitis plays an important role in the prevalence of amputations in patients with diabetes. Obtaining clean, infection free margins is the most important goal, because residual osteomyelitis is a strong predictor of clinical failure and comes with many postoperative complications, even the necessity to operate again or have a major amputation later in evolution. Background and Aim: The outcome for some colorectal cancer patients correlates poorly with classical prognostic factors, like tumor stage. Tumor budding (TB) is a promising and intensely studied new prognostic factor. We aimed to evaluate the reliability of bud counting on Hematoxylin-Eosin (HE)-stained and immunohistochemically (IHC)-stained scanned slides. Materials and Methods: We evaluated 21 cases of robotic surgery colorectal cancer specimens that were submitted to the Department of Pathology, Emergency County Hospital, Timisoara, Romania. TB was assessed by one experienced (R3) and two junior pathologists (R1, R2), in 10 circular areas at 20x [0.785 mm(2)] on scanned HE-stained and IHC-stained [cytokeratin (CK) AE1/AE3] slides. Interobserver agreement (Cohen s kappa) and intraclass correlation coefficient (ICC) were calculated. Results: In the case of HE-stained slides, the inter-item correlation matrix showed values between 0.632 and 0.84, while the ICC on average measures for consistency showed very good correlation [ICC: 0.887, 95% confidence interval (CI): 0.765-0.95)]. The inter-item correlation matrix for IHC-stained slides comprised values between 0.864 and 0.921, while the ICC for average measures for consistency yielded an excellent value (ICC: 0.95, 95% CI: 0.896-0.978). We identified higher values for budding scores on IHC-stained slides, in comparison to the HE-stained slides: in 19/21 cases for R1 (average increase of 234.85%), 16/21 cases for R2 (average increase of 114.14%), and 20/21 cases for R3 (average increase of 66.92%). Conclusions: We consider the method of buds counting in 10 microscopic fields on scanned slides to be reliable and valuable. TB counts are higher on IHC-stained slides and associate a better interobserver agreement. Objective: Placental lesions and placental ischemia are typical elements of intrauterine growth restriction (IUGR). The aim of this study is to analyze histological and immunohistochemical (IHC) changes in the placentas of IUGR fetuses. Materials and Methods: In this prospective study, 126 placentas from small for gestational age (SGA) pregnancies (newborns with birth weight <10th percentile) that formed the study group and 31 placentas from pregnancies without SGA representing control group, were included. Placentas were examined according to standard protocol. Histopathological and IHC examinations of placentas were performed for analysis. Results: A certain type of lesion of placental injury is increased in placentas from SGA pregnancies. These placental lesions were placental infarction (over 5%), increased syncytial knots, intervillous fibrinoid deposition, villous thrombohematoma. Other common placental lesions were probably related to fetal adaptation to placental ischemia or represent a placental change characteristic of pregnancy evolution. Conclusions: It seems that although IUGR/SGA fetuses are more commonly associated with histological placental abnormalities, it cannot be established whether these abnormalities certainly contribute to IUGR, as there are no specific placental lesions in SGA placentas. Pseudo-angiomatous aspect, associated with increased syncytial knots, was specific for vascular hypoxia. Especially the magnitude of modifications of the placental structure beyond the qualitative modifications, which also lead to functional changes, are involved in this pathology of pregnancy, the onset of lesions being triggered at the level of stem villi. The molecular structure of E-cadherin and its function are intimately related to beta-catenin, their interactions ensuring the cell morphology and stability. Alterations of E-cadherin-beta-catenin complex facilitate the tumor growth and spreading in the carcinogenic mechanism. We aimed to assess the E-cadherin and beta-catenin immunoexpressions in different variants of papillary thyroid carcinoma (PTC), and the relationship of these markers with the clinicopathological prognostic factors. Our study group included 70 cases of PTC divided into two risk groups. The low-risk group comprised 45 cases diagnosed as conventional, follicular, oncocytic, macrofollicular, and clear cell variants, whereas the high-risk group consisted of 25 cases diagnosed as tall cell, follicular angioinvasive, cribriform-morular, hobnail, diffuse sclerosing, and solid subtype, respectively. Immunohistochemical exam was performed by using anti-E-cadherin and anti-beta-catenin antibodies, and their expressions were semi-quantitatively evaluated. The association between E-cadherin and beta-catenin, respectively, and clinicopathological prognostic factors was statistically analyzed. We noted statistically significant differences between membranous E-cadherin expression (low versus high) and tumor size, histological risk groups, tumor stage, lymph node metastases, vascular invasion and tumor relapse. We also found statistically significant correlation between membranous beta-catenin expression (low versus high) and the risk groups, tumor size and tumor stage, but no associations of cytoplasmic beta-catenin (low versus high) with the clinicopathological characteristics. Our study demonstrates that E-cadherin and beta-catenin expressions differ in low- and high-risk groups of PTC. The aggressive behavior of the high-risk histological variants is associated with reduced membranous E-cadherin, and loss of membranous beta-catenin followed by enhanced cytoplasmic expression. These results open large standpoints for a deeper characterization of the histological variants of PTC. Aim: In the general economy of the stomatognathic system functionality, the occlusal function has an important role, meaning both the dental-dental reports and the dynamic reports interarch-interarch. Because of the interrelationships and inter-dependency that govern the functioning of the biological systems, a pathological change affecting a component of the stomatognathic system produces impaired functioning of the others. The aim of the present study is to assess the morphological changes occurred in the dental pulp components of teeth affected by occlusal trauma. Materials and Methods: Fragments of dental pulp coming from 45 patients with occlusal trauma were processed using classical histological techniques (formalin fixation and paraffin embedment) and stained with Hematoxylin-Eosin (HE), Masson s trichrome and anti-CD34 antibody immunostaining, in order to highlight the peripheral zone and central connective tissue of dental pulp morphological changes. A set of parameters namely thickness of peripheral zone components, calcifications, fibrosis and vascular density in the dental pulp were assessed individually and based on three topographical criteria namely the affected tooth, the position on the dental arches and the position according to sagittal plane. Results: There was no correlation between morphological changes of dental pulp and the topography of teeth with occlusal trauma. The size of the peripheral area of the dental pulp and that of its components evolved in the same sense, whether it was growth or decrease. Decrease of the peripheral area was associated with the increase of collagen fibers density, calcium deposits and density of the capillary network. The direct correlation between the amount of collagen fibers and vascular density seems somewhat paradoxical but it can be explained by the reemergence of chronic inflammatory events located in the dental pulp. Conclusions: It seems that dental pulp morphological changes are not influenced by the teeth with occlusal trauma topography. With one exception (the components of peripheral zone), most of the correlations between the dental pulp morphological changes were only suggested but not validated statistically, which requires further studies on larger groups together with the introduction of inflammatory cell population studies. We conducted a retrospective study, between 2013 and 2018. The study was conducted by analyzing the comparative imaging of two groups of patients. The two groups comprise 42 patients, 14 women and 28 men aged between 17 and 70 years old, to whom objective variables of statistical relevance were tracked. The results of this study show that there is a significant correlation between an angle value of less than 45 degrees and the rupture of the anterior crossed ligament. Background: The B-Raf proto-oncogene serine/threonine kinase (BRAF) V600E [(BRAF(V600E)] mutation represents a very specific marker for papillary thyroid carcinoma (PTC), including microcarcinomas (PTMCs). However, assessment of the BRAF(V600E) mutational status is expensive and not available in all pathology laboratories. Aim: We aimed to evaluate if we can identify those morphological features that could predict the presence of the BRAF(V600E) mutation in a series of PTMCs. Materials and Methods: Nineteen PTMCs with analysis of 25 tumor foci were included. The following histological features were evaluated: size of the tumor, multifocality, extrathyroidal extension, tumor s border, characteristic PTC nuclear features, tumor-associated stromal reaction and histological variant. All PTMCs foci were subject to real-time polymerase chain reaction (RT-PCR) amplification targeting the BRAF gene. BRAF(V600E) mutation was assessed by high resolution melting (HRM) analysis and confirmed by Sanger sequencing. Morphological features associated with BRAF(V600E) positive and BRAF(V600E) negative PTMCs were compared using the two-tailed Fisher s exact test, with alpha set at <=0.05. Results: Out of the 25 PTMC foci, 16 (64%) were BRAF(V600E) negative, whereas nine (36%) were BRAF(V600E) positive. Our data showed that subcapsular localization (p=0.013), conventional histological type (p=0.05) and tumor-associated stromal reaction (moderate/extensive fibrosis) (p=0.032) were significantly associated with the mutation. Conclusions: We have demonstrated the value of several morphological features in predicting a BRAF(V600E) mutation profile in PTMCs. All these parameters should be documented in the histopathological report, as they seem to be associated with this mutation and could serve as a risk stratification tool in the selection of patients in need for adjuvant post-surgery therapy. Multiple sclerosis (MS) is a complex chronic neurodegenerative disease that involves an abnormal autoimmune response directed against the brain, nerves and spinal cord; it is considered the most frequent cause of neurological disability, because MS-associated inflammatory lesions can affect a wide range of systems to a varying degree and may cause a plethora of neurological comorbidities and symptoms. The symptoms are quite variable from patient to patient and depend on the spatial distribution of the central nervous system (CNS) lesions, but usually involve sensory disturbances, cognitive deficits, unilateral vision loss, bladder dysfunction, ataxia, fatigue, double vision, weakness of the limbs and intestinal disorders. Experimental autoimmune encephalitis (EAE) mouse model reproduces the pathological features of the human disease, and is a widely used model used for studying the pathology and different treatment options in the preclinical stage. In this study, we aimed to evaluate the motor function, as well as the degree of demyelination and inflammatory changes in the brains of mice immunized for the myelin oligodendrocyte glycoprotein (MOG)35-55, and treated with Cerebrolysin. Animals were randomly assigned to one of the three groups: (i) EAE untreated group (n=10), (ii) EAE treated group (n=10), and (iii) control group (n=5), and their motor dysfunction was followed until the clinical pathology begun to improve. We also analyzed histologically and immunohistochemically the lesions in the optical nerves, cervical spinal cord and medulla. Our results showed higher deficit scores for untreated animals compared to treated animals. After harvesting the tissue, we have first evaluated the density of myelin in the optical nerves, cervical spinal cord and medulla and we found significant differences between treated and untreated groups of animals. We continued to investigate the structure of the CNS parenchyma by evaluating the intensity and morphology of the neuronal cytoskeleton and microglia by immunohistochemical stainings. Although larger animal groups are necessary, this is the first pilot study to investigate the use of a neurotrophic factor as a putative treatment option for a MS model. This study was conducted on 300 patients with infiltrative breast carcinoma, of which 112 cases underwent radical mastectomy, and 188 were conservatively operated. Forty-four patients experienced local relapses during the clinical follow-up. The immunohistochemical (IHC) study used the Labeled Streptavidin Biotin (LSAB)/Horseradish peroxidase (HRP) method, which evaluated the estrogen receptor (ER) and progesterone receptor (PR), as well as human epidermal growth factor receptor 2 (Her2/neu) expressions in tumor cells. After IHC analysis, all cases were classified into one of the following four immunophenotypes: ER+/PR+ classical phenotype, ER-/PR-, ER+/PR- and ER-/PR+ phenotypes. Correlating hormonal phenotypes with Her2 status, we found that Her2 is significantly associated more frequently with the ER+/PR- phenotype, while the absence of Her2 was associated more frequently with the ER+/PR+ phenotype but with no significant differences. Local recurrences were significantly more common in patients with absent ERs than those who had these receptors present in the primary tumor. Similarly, mammary tumors with absent PRs recurred significantly more frequently than those with PRs. The positivity of Her2 is significantly associated with the absence of PRs in both type of surgery (conservative or radical). Local recurrences are significantly correlated with both negative receptors phenotype, regardless of the type of surgery. IHC markers, represented by hormone receptors for estrogen and progesterone, and Her2 oncoprotein, can be useful for identifying patients who are at increased risk of local recurrences after conservative or radical surgery for breast cancer. 15. Bipolar en bloc tumor resection versus standard monopolar TURBT - which is the best way to go in non-invasive bladder cancer? The aim of the study was to observe similarities and differences regarding surgical safety and prognosis between en bloc bipolar resection and monopolar transurethral resection of bladder tumors (TURBTs) in medium size papillary non-muscle invasive bladder tumors (NMIBTs). A total of 90 patients with papillary bladder tumors presenting a diameter between 1 and 3 cm were equally divided and alternatively assigned for en bloc bipolar ablation (the study group) and conventional TURBT (the control group). During one year, every three months, the follow-up was performed and the protocol included urinary cytology and cystoscopy. Similar mean patients age and tumor diameter were determined in both groups. In the study group, it was noticed an important reduced rate of obturator nerve reflex adverse event that caused bladder wall perforation. In addition, comparing the results between the two groups, the following aspects were observed in the study arm: decreased mean operation time (13.4 versus 19.7 minutes), hemoglobin level drop (0.28 versus 0.76 g/dL), catheterization period (1.9 versus 2.8 days) and hospital stay (2.3 versus 3.1 days). A total of 41 and respectively 40 patients completed the 12 months follow-up protocol. After one year, the en bloc group presented a significantly lower recurrence rate, superior surgical safety, decreased perioperative morbidity and faster recovery. Therefore, the en bloc surgery approach presented a better oncological prognosis due to the reduced heterotopic NMIBT recurrences up to one year. Implantology is a highly researched field with a constant concern in finding and studying new implant materials. Lately, zirconium has become a very attractive alternative to the detriment of titanium, but the research results were sometimes contradictory. Thus, we considered as opportune to study the osseointegration of zirconium dental implants in rabbit femur, three months after insertion. The biological material was represented by five rabbits and the experimental protocol was approved by the Ethics Committee of the University of Oradea, Romania. The implants (zirconium ceramic dental implants: 5 mm length, 2.6 mm diameter) were inserted in the femur under controlled conditions, after creating a bone defect. The animals received the appropriate postoperative care. Three months later, the implantation area was harvested and processed for histological examination. The assessment of the osseointegration process of the zirconium implants showed that they were very well tolerated by the host organism that did not trigger any rejection processes. Approximately 80% of the compromised bone was replaced with newly formed bone in advanced stages of remodeling and consolidation. The proliferated bone near the implants acquired a structure similar to the rabbit diaphyseal bone, but with higher density and size of the osteons. The stage reached by the osseointegration process three months after the insertion of the implants, ensures a good consolidation of the implants that supports the prosthetic structures, which are to be built on them. Aim: Occlusal trauma causes major modifications of the coverage periodontium, which in turn reflect on the dental unit. The aim of the present study is to evaluate some of the morphological modifications occurred in the marginal periodontium surrounding teeth affected by occlusal trauma. Materials and Methods: Fragments of marginal periodontium coming from 51 patients with occlusal trauma were processed using classical histological techniques (formalin fixation and paraffin embedment) and stained with Hematoxylin-Eosin (HE), Masson s trichrome and anti-CD34 antibody immunostaining, in order to highlight the epithelial and connective tissue changes of gingival mucosa. A set of epithelial and connective tissue morphological parameters were assessed individually and based on three topographical criteria concerning the affected tooth. Results: The epithelium and especially its superficial compartment presented changes depending on the tooth type and the dental arch. Epithelial thickness had the tendency to decrease as the fibrosis in both corium compartments and vascular density in the deep corium compartment were increasing. Leukoplakia present around the affected teeth but not always was related with the tooth type and was more obvious as the superficial compartment of the epithelium was thicker and as fibrosis was more reduced in the papillary compartment of the corium. Vascular density reduced when fibrosis process increased in the corium. Conclusions: Lesions determined by occlusal trauma and their topography can and are influencing locally the different structures of the surrounding periodontium. Maxillary expansion is one of the earliest methods of obtaining space used in the field of orthodontics. Maturing craniofacial sutures along with the increase in bone density and rigidity are main causes of high resistance of the maxilla to transversal expansion forces applied to the midpalatal suture through orthodontic appliances. Fifty-three patients, with a mean age of 16.4 years and a diagnosed transverse plane orthodontic anomaly were included in this study and divided in two groups: male group and female group. Cone-beam computed tomography (CBCT) was used for measurements conducted in order to determine bone density before and after jaw expansion in different segments of the midpalatal suture: anterior, middle and posterior. In males, slightly higher bone density values were observed in the midpalatal suture than in females before and after maxillary expansion, with average values ranging from 128.5 Hounsfield units (HU) to 672.9 HU. Bone density along the maxillary suture plays an important role in the success rate of orthodontic treatment. Assessing the palatal suture maturation on CBCT images is a very promising predictor for conventional or surgically assisted jaw expansion. Intra and extraoral pictures were used to evaluate the position of the zenith in the aesthetic area and gingival aesthetic line (GAL) class. In the study, there was a significant reduction in the number of class II, class III and class IV and an implicit increase of GAL I class that ensure a pleasant transition of the gingival level between the anterior maxillary teeth. The distribution of the gingival height in terms of the classes found prior to the orthodontic treatment remained unchanged after treatment. Introduction: Periapical granuloma is one of the most frequent periodontal pathology and belongs to the group named as apical periodontitis. Materials and Methods: Out of 78 of diagnosed granulomas, we selected samples that we analyzed histologically and immunohistochemically. Results: The histopathological aspect has been dominated by the presence of mononuclear cells of the lymphocyte and plasma cells type, showing the chronic aspect of the apical lesion. Also, we noticed that in the apical granuloma macrophages occur most often. This density of macrophages explains cellular and tissular disruption that occur in apical region of the tooth under the influence of bacterial flora that reached this area, as they have the role to phagocyte pathogens and cell and tissue residues that result from bacterial aggression. The reaction of the plasma cells, determined by their number, has been always associated with the age of the granulomas, and it is more intense in old, neglected granulomas, compared to recent granulomas. Conclusions: The number and type of immunity cells varies in the apical granuloma accordingly to the age of granuloma. Osteonecrosis of the femoral head occurs because of the suppression of blood circulation. At the level of the area affected by the ischemic phenomenon, there are two types of events, in the first stage there is necrosis of the cellular elements, followed by a reparatory phase of the spongy bone tissue. The objective of the study was the histological and immunohistochemical (IHC) analysis of bone metabolism in the repair phase. We observed the action of the main cells involved in the remodeling, the osteoblasts and the osteoclasts, following the reaction of the markers of their activity: osteoprotegerin, osteonectin, osteopontin. We included 23 patients diagnosed with femoral head osteonecrosis, stage II, Ficat and Arlet classification, biological material required for histological and IHC analysis being obtained during hip arthroplasty. Regardless of the age or presence of risk factors, the reaction to osteoprotegerin was mildly positive, being only highlighted at the level of the reactive dividing line, being absent in the other areas, indicating a reduced activity of inhibiting differentiation and activation of osteoclasts, also highlighted with classical histology methods, the affected area being well-defined and we could observe the necrotic tissue resorption by osteoclasts. The intense positive reaction of osteopontin and osteonectin, especially at the line of demarcation, is due to the increase in the number of osteoblasts required for the synthesis of neoformation bone tissue. We believe that the aspects revealed by our study can be a track in finding new-targeted therapies useful in stopping the development of the disease. Introduction: Osteonecrosis of the jaw (ONJ) is a multifactorial condition associated with bisphosphonates (BPs) treatment, head and neck irradiation, malignancy, chemotherapy, periodontal disease or trauma. The first cases of BPs-related ONJ (BRONJ) were reported over a decade ago. Patients, Materials and Methods: The study was retrospective and analyzed archived material. The study included 38 patients diagnosed and treated in the Clinic of Oral and Maxillofacial Surgery, Emergency City Hospital, Timisoara, Romania, for BRONJ, between 2013 and 2016. For all the cases were noted gender, age, localization of osteonecrosis, therapeutic indications for BPs (osteoporosis or malignancy), history of radiotherapy or chemotherapy, presence of bone metastases. If the treatment consisted in surgical removal of necrotic bone, the surgically removed specimens were sent to Service of Pathology of the same Hospital. The excised specimens were prepared with routine histological technique. Results: All the patients included in the current study were diagnosed with BRONJ. The patient history and clinical characteristics were the most useful diagnostic methods. Radiographic changes are not significant in early stages of osteonecrosis. The prevalence of BPs-associated ONJ is higher between 55-74 years old. Conclusions: ONJ is an important complication of BPs medication. The majority of affected patients develop this complication after dentoalveorar surgery, especially after dental extraction. Therefore, a good state of dental health is one of the most important directives when dealing with potential candidates for BPs therapy. Aim: The aim of our study was to compare baseline characteristics and clinical data as well as endoscopic retrograde cholangiopancreatography (ERCP) results in patients with and without periampullary diverticulum (PAD). Patients, Materials and Methods: A single center retrospective analysis was conducted from June 2016 to June 2017 and the patients that had undergone ERCP were divided into two groups, according to the presence (Group A, 43 patients) or absence (Group B, 55 patients) of PAD. Results: Mean age of patients with PAD was significantly higher than the ones in the control group (69.95 years vs. 55.35 years, p<0.01), but the two groups had a similar structure regarding the gender. The distribution of the PAD types identified 18.6% type 1 diverticula, 25.6% type 2 diverticula, and 55.8% type 3 diverticula, with a mean dimension of 12.7+/-4.63 mm. Higher rates of failed (11.6% vs. 0%) or difficult cannulation (25.6% vs. 16.3%) were observed in Group A, but the rate of peri-procedural complications was similar in patients with diverticula compared to the control group concerning bleeding, perforation and pancreatitis, with a greater incidence of infections in the group without diverticula. Conclusions: Our study confirms that PAD is a pathology occurring more frequently with increasing age and can increase the rate of difficult or failed cannulation, but even in this context, there is no increase in the peri-procedural complications even if in training endoscopists perform the procedure. Lip cancers account for 10-12% of the total head and neck cancers and, although squamous cell carcinoma is by far the most common lower lip cancer, the basal cell carcinoma (BCC) seems to be more common for the upper lip. Most BCCs have a clinically indolent behavior, but there are also local aggressive and/or metastatic cases, with the incidence of such cases being estimated at about 1-10% of all cases of BCC. Many of the molecular mechanisms underlying this aggression are still unknown, which is why our study aimed to investigate the potential prognosis of a few markers, such as C-X-C chemokine receptor type 4 (CXCR4), alpha-smooth muscle actin (alpha-SMA) and Wiskott-Aldrich syndrome like (WASL) in upper lip BCCs. For this purpose, 24 basocellular cancers with this localization have been investigated immunohistochemically, histopathologically belonging to the next varieties: superficial, nodular, micronodular, adenoid cystic, keratotic, sclerodermiform and mixed. Regardless of the histopathological subtype, for all invasive cases we have recorded an increased reactivity of the three markers especially in the invasion front, reactivity also present at the stroma level, especially at the stroma-parenchyma interface. The most intense immunoreactivity was obtained for the micronodular and sclerodermiform subtypes, confirming their biological behavior to be more aggressive than the rest of the investigated strains. All these results confirm the prognostic value of the CXCR4/alpha-SMA/WASL panel in assessing the biological behavior of the upper lip BCC. Soft peri-implant tissues are important to ensure the integration of a dental implant, and information on their morphophysiology may explain some clinical failures. Through this study, we aim to contribute to a better understanding of the behavior of peri-implant soft tissue, the morphological support being the one that can explain the different clinical situations. Thus, we sought to reconcile clinical, histopathological and immunohistochemical (IHC) aspects of soft peri-implant tissue, in patients who did not show clinical mobility or radiological signs of bone resorption four months after insertion of implants, some of them showing no clinical signs of inflammation. Immunohistochemically, we highlighted the cellular populations participating in the inflammatory process present in the peri-implant mucosa, in the two groups of patients. The IHC identification of these types of cells and the degree to which each of them was represented by the use of monoclonal antibodies can provide additional insight into the local response of peri-implant soft tissue in healing and osseointegration. This helps the clinician to improve the clinical success of dental implant treatment because the soft tissue surrounding the dental implant separates the implant from the oral cavity and makes a biological seal that prevents the development of the peri-implant pathology. Thus, the soft tissue surrounding the dental implants ensures the conditions of osseointegration and hence the long-term survival of an implant. The aim of this preliminary study is to histologically evaluate the effects of erbium-doped yttrium aluminum garnet (Er:YAG) laser on soft and hard tissues during implant bed preparation, in comparison with bur and cutter in order to observe the following aspects: (i) the shape of the cavity, (ii) the presence of debris, and (iii) structural modification of the cell architecture. Bone temperature changes during the preparation of the implant bed were also measured in order to evaluate thermal damage on soft and hard tissues. Er:YAG laser, Fotona X-Runner scanner and circular cutter of 5 mm diameter were compared using an in vitro model. Implant bed preparations were performed in bovine rib bone (hard tissue) and tongue muscle (soft tissue) tissues. Results of the study show that in all bur samples were present more debris and more blood cells than in laser samples, which, according to the rules of healing processes, can be a negative factor for the osseointegration process. Regarding the thermal effects on soft tissue, they were present when using MAX mode, but absent when using quantum square pulse (QSP) mode. A preliminary conclusion emphasizes the use of laser to prepare the implant site without debris formation. Nowadays, is not still present a laser device that can overtake the technical limitations of the laser scanner (i.e., deepness control and scanner movement during the preparation of the holes, etc.). Purpose: The paper intends to present the results of using new methods of a new generation diode laser transscleral cyclophotocoagulation (TSCPC) in patients with different types of glaucoma. Patients, Materials and Methods: There have been treated 53 eyes from 59 patients with glaucoma refractory to medical, laser or surgical treatment. We have used the newest generation of 810 nm wavelength diode laser. There have been used two protocols of continuous-wave diode laser emitting radiation for cyclophotocoagulation. The first technique - the standard cyclophotocoagulation (high power and low exposure duration) - has been used for the eyes with limited visual function [visual acuity (VA) extremely low or eyes disorganized]. The second technique - slow coagulation, also named slow burn (lower power and greater exposure duration) - has been used for the eyes with apparently better visual prognosis (VA>=20/400). For evaluation, we followed both subjective parameters (eye pain decrease) and objective parameters [intraocular pressure (IOP) lowering and VA evolution]. Patients have been evaluated before laser intervention and postoperative at one, three and six months. Results: IOP has significantly decreased in both patient groups. In the eyes with better visual function (VA>=1/20), where we have used the slow coagulation technique, we found no decrease of VA. Eye pain has disappeared in almost all treated cases. Conclusions: The diode laser TSCPC is an efficient method of lowering IOP and decreasing eye pain. The slow burn technique has been shown its efficiency for extending the indications of cyclophotocoagulation also in glaucomatous eyes with better functional prognosis. The article presents aspects of crown and root morphology of the superior wisdom teeth, aiming to several parameters: size, shape crown and occlusal surface‚ number, topography and orientation of the roots in order to determine which the most common morphological types are. For this purpose, the upper wisdom teeth were collected. According to studies, the dominant form of the dental crown is parallelepipedic, the rectangular or parallelogram shape of the occlusal surface has large mesial and distal-oriented sides. The positive occlusal forms are generally poorly demarcated; cusps are less tall and rarely individualized. In half of the cases, the root is unique, voluminous, straight or with a curved distal tip. Anomalies of permanent dentition, by the frequency of the cases, also correspond to some unanimously recognized problems of public health. The objective of this study is to determine the prevalence of non-syndromic hypodontia and oligodontia and to identify the types of associated dental anomalies in the permanent dentition of children and adolescents in the NW of Romania. The study was conducted between 2008 and 2015 on a group of 566 children aged between 12-18 years old. Dental agenesis was diagnosed using clinical and radiological criteria. The numbers and types of teeth missing were noted. Third molars were excluded. Hypodontia had a prevalence of 2% in girls and 3.76% in boys (p=0.007), and oligodontia of 0.33% in girls and 0.38% in boys (p=0.367). Unique abnormalities were registered at 1% in girls and 1.5% in boys (p=0.026), those with two associations at 0.67% in girls and 1.5% in boys (p=0.015), and those with triple association at 0.67% in girls and 1.13% in boys (p=0.037). Hypodontia/oligodontia has been identified in association with other dental abnormalities, such as inclusion, microdontia, and enamel hypomineralization. The most frequent was the association of hypodontia with enamel hypomineralization. Introduction: Hepatocellular carcinoma (HCC) currently represents a major health concern, mainly for its shifting pre-existing conditions that in turn lead to late diagnosis, thus increasing the mortality rate. An improved training of medical personnel involved in diagnosis, staging and the management of treatment is required. Aim: We thus aimed to transition tumor view from two-dimensional, on-screen, methods to real, palpatory three-dimensional (3D) representations that can be printed using generally available tools, thus approachable in virtually any medical setting worldwide. Materials and Methods: After obtaining ethical clearance, we included imaging contrast-enhanced data from 10 confirmed cases of HCC that we translated into a 3D computer render of the tumor with as much morphological data as possible. In addition, we simulated the inner structure of each tumor, simulating different stiffness levels across their respective surfaces, in order to better gauge possible necrosis or vascular particularities. This translated into 3D printed models that were obtained by using commercially available materials, experimenting with different filling methods in order to better simulate the stiffness of the lesion. Results: We administered a structured questionnaire to 43 students and 12 resident doctors (gastroenterologists and surgeons) that manage HCC cases. We assessed tumor morphology and the usefulness of the proposed model in everyday practice and evaluated their use in an academic environment. Conclusions: The proposed method provides a cheap alternative to costly medical simulators, providing both curricular advantages as well as integrating well into normal HCC medical management. Our study included a total of 259 patients with diabetes, who were admitted to the Department of Plastic Surgery and Reconstructive Microsurgery of the Emergency County Hospital of Pitesti, Romania, in 2016, with the diagnosis of diabetic foot. Of the 259 patients, 55 (21.23%) were diagnosed with type 1 diabetes, and the remaining 204 (78.77%) were diagnosed with type 2 diabetes; the ratio of type 1/type 2 diabetes was 1/3.7. The injuries presented by the patients were osteitis (27.81%), moist gangrene (21.62%), abscesses (18.92%), cellulitis (11.19%), various forms of fasciitis (8.88%), perforating strand (6.18%), and dry gangrene (5.4%). The disease was most commonly diagnosed in males in the rural environment. Most of the patients were in the age group of 61-70 years old. All patients were surgically treated, but 142 (54.82%) patients needed amputations of foot segments (fingers, metatarsal or tarsal bones). The histopathological and immunohistochemical study on excised fragments revealed the existence of a chronic inflammatory process formed mainly from macrophages, mast cells and CD4+ T-lymphocytes. A 46-year-old female diagnosed several years ago with arterial hypertension and an ischemic stroke with significant recovery was admitted for dyspnea on usual physical activity and fatigue. Physical examination revealed signs of heart failure with crackles on both lung bases, distented jugular veins, accentuated pulmonic valve closure (P2) and tricuspid regurgitation murmur. Echocardiography identified a large tumor in the left atrium, suggestive of atrial myxoma, which caused a severe functional mitral stenosis and produced severe pulmonary hypertension. A cardiac embolic source should always be checked in young patients with stroke. Atrial myxoma can mimic a variety of diseases: rheumatic mitral stenosis, infective endocarditis or autoimmune disease. A review on myxoma s histology, immunohistochemistry and genetics together with clinical aspects is presented. We present the imagistic and pathological assessment of a unique case of complete pentalogy of Cantrell associated with craniorachischisis, pulmonary extrophy and right-sided aortic arch with aberrant brachiocephalic artery. For this particular case, the complete and correct diagnosis required a post-mortem imagistic high-resolution magnetic resonance imaging (MRI) at 7 T and detailed stereomicroscopic autopsy. Also, we discussed the pathogenesis and possible etiology of pentalogy of Cantrell and the associated malformations of the case presented. Pilomatricoma is a benign skin tumor originating from the matrix cells of the hair follicles. Sometimes, its diagnosis can be difficult, especially in the preauricular region, where in the differential diagnosis, in addition to other dermal and subcutaneous masses, primary and secondary parotid gland tumor lesions must be also considered. A 34-year-old female was referred to our Institution with a right preauricular swelling over 12 months, which enlarged in the last two months. The ultrasonography confirms the origin of the tumoral mass in the skin of the preauricular region and not from the superficial lobe of the right parotid gland. The patient underwent complete tumor excision and the histopathology and immunohistochemical exams confirmed the diagnosis of a conventional pilomatricoma evolving to a late regressive lesion. She was discharged considered as cured and no recurrences were reported within a period of eight months of follow-up. This is the first reported case in the last 30 years, in this location, in the Department of Oral and Maxillofacial Surgery our Institution. Regarding the rarity of these tumors, especially in this location, we must keep in mind to consider a broader differential diagnosis that includes both tumoral and non-tumoral skin lesion and also parotid gland lesions. Chondrosarcoma (CHS) is the third most common primary bone tumor after myeloma and osteosarcoma. Histologically, it is made of pure hyaline cartilage differentiation. The tumor itself may have myxoid modification and calcification. It occurs especially after 50 years, with an equal gender distribution. Most CHS are solitary, the etiology is still unclear and most of them are discovered accidentally. Early diagnosis is crucial for a good prognosis. In this paper, we would like to present a case of a female patient with an accidentally discovered CHS of the iliopubic and ischiopubic ramus of the pelvis. The purpose of this report is to highlight the importance of multidisciplinary management of tumor pathology, especially when the site of the tumor is surgically hardly accessible and to underline possible common genetic aspects of benign and malignant tumors. Endometrial stromal tumors are very rare, representing approximately 0.2% of uterine malignancies, having an incidence of one to two from a million of women. The diagnosis cannot be established by imaging, it is histopathological only, often necessitate supplementary immunohistochemistry tests. We report the case of a 27-year-old woman who had an initial diagnosis, in another hospital, of uterine adenomyoma, established by dilatation and uterine curettage and then by subsequently histopathological exam. This diagnosis led to an initial non-oncological surgery, with interannexial total hysterectomy. The establishment of the final histopathological diagnosis of stromal endometrial sarcoma has led to a serious reassessment of the case. Making a review of the literature, we found very few cases of endometrial stromal sarcoma in young women less than 30 years old and we have not identified any clear strategy of treatment. However, from precautionary and considering that may be at risk, even with very few cases reported, the distance metastases can be present, sometimes at large intervals of time, we decided, for oncological safety, reintervention after one month. At the second surgery, it was practiced bilateral salpingo-ovarectomy, cardinal ligaments excision, partial omentectomy, bilateral pelvic lymphadenectomy extended lumbo-aortic and interaortico-cava, sampling biopsy from the inguinal femoral adenopathy and re-excision of the vaginal vault. The evolution was favorable, the patient being follow-up together with the oncologist specialist. The acute abdomen with its many clinical aspects is not a condition that eludes pregnancy; acute appendicitis being the most frequently incriminated, but when it comes to its complication - peritonitis and the pregnant is a teenager, the cases cited in the literature are quite rare. We present the case of a 15-year-old teenager pregnant within 24 weeks admitted from the emergency department with the diagnosis of acute abdomen and operated for generalized peritonitis due to a perforated appendicitis. The microscopic analysis of the specimen indicated the presence of ulceration and extensive and deep and necrosis of the appendicle wall, the residual structures being dissected by a predominantly polymorphonuclear leukocytes inflammatory infiltrate associated with eosinophilic fibrinous deposits. Gangrenous extended necrosis of appendicle tissues, on the background of inflammatory thrombosis of appendicle vessels and mesothelium, sustained the diagnosis of acute gangrenous appendicitis. After a rather difficult evolution, she gave birth to a healthy fetus through a segmental-transverse Caesarean section at 35 gestational weeks. One week after the birth, the patient was operated for bowel obstruction by means of bridles and adherents. Both the appendicitis and the intestinal obstruction syndrome have been resolved by classic surgery. The fetal and maternal, vital and functional prognosis was good. Congenital hyperammonemia (HA) due to inborn errors of metabolism is a rare condition with a high rate of mortality. The main effects occur at the central nervous system (CNS) level, being neurotoxic by alteration of the neurotransmitter function. HA can be triggered by an inappropriate diet, infection or stress, but can also occur without a precise cause. In cases of metabolic crises, patients require immediately intensive care. In the last seven years (2011-2017), we cared in the Department of Genetics, Dr. Gavril Curteanu Municipal Clinical Hospital, Oradea, Romania, six patients with different causes of congenital HA: one case with argininosuccinate lyase deficiency, two cases (brothers) with argininosuccinate synthase deficiency, one case with non-ketotic hyperglycinemia, one case hyperglycinemia and one case with HA with unknown etiology. The medical surveillance and care of these children over a long period of time raise serious problems for the family and society. These patients are dependent on medical services: qualified medical staff (pediatrician, geneticist, radiologist, biochemist, nutritionist, and psychologist), expensive and repeated medical investigations, prolonged and costly medication. Most of these costs could be avoided by early diagnosis and treatment, rigorous monitoring of HA, ensuring proper diet and medication. Our experience regarding the clinical and genetic particularities of patients with congenital HA could be an opportunity for the better knowledge of special needs of these patients, especially regarding the psychological and social aspects. Ionizing radiation was used in the past for treatment of several benign cutaneous conditions, and particularly hemangiomas. Even though radiotherapy was generally effective, it significantly augmented the risk for malignancies, resulting in a consequent heavy decline of its use for benign conditions. However, radiation-induced neoplasia is still encountered in adult patients irradiated during childhood or adolescence. We report a case of well-differentiated squamous cell carcinoma developing on the lower lip of a 59-year-old woman who had previously undergone local radiotherapy for a hemangioma, in which the use of non-invasive imaging techniques such as in vivo reflectance confocal microscopy (RCM) and dermoscopy allowed an early diagnosis and a prompt, effective treatment. Owing to its capability of assessing microscopic features of dysplasia and neoplastic changes, RCM in combination with dermoscopy may provide an invaluable tool for early detection of malignant changes in previously irradiated cutaneous and mucosal areas. An intensively researched and yet poorly understood phenomenon, both at clinical and neurobiological level, is the determinism of treatment-resistant depression. Even more controversial are the stages of approaching therapeutically this pathology because there are no evidence-based recommendations stating that a pharmacological agent is superior to another, on medium and long-term. Due to the lack of golden standard approaches, physician s experience, therapeutic alliance and a close monitoring stand as the most useful good practices in the treatment of resistant depression. The neurobiology of this pathology is incompletely characterized, and the current paper will present data derived from single-photon emission computed tomography as arguments for a better understanding of the treatment-resistance in major depression. These data have been compared with the existing data in the literature and arguments in favor of using this investigational method have been formulated. All the three cases presented are patients diagnosed with treatment-resistant major depression, each case with its own psychiatric and somatic background, and therefore with its own therapeutic approach. In all these cases, structured interviews and psychometric scales were applied in order to allow a flexible pharmacological regimen, adjusted to the patient s dynamic needs. Measurements for health-related quality of life were considered necessary for treatment-resistant depression monitoring because low values registered in this domain have important prognostic significance. Translational studies on animal models of depression support the existence of cerebral structural dysfunctions or lesions which can be correlated with clinical and neuroimaging data, allowing for the formulation of neurobiological and psychopharmacological models for treatment-resistant depression. Ethylene glycol is a toxic alcohol that is mainly introduced into an organism through the digestive pathway. Its priority toxic metabolites are glycolic acid and oxalic acid. We present the case of a young person, of the male persuasion, without any personal pathological history, found unconscious and presenting signs of violence. The patient is emergency hospitalized presenting coma, convulsive syndrome, severe metabolic acidosis and a positive result for alcoholism. Anamnestic data is extremely poor. The results of the clinical and paraclinical examinations suggest a possible poisoning with toxic alcohols. Despite the drug treatment and the hemodialysis, the evolution is unfavorable, resulting in death one week after admission. Through the forensic examination, the followings were found: cerebral and leptomeningeal edema, focal cerebral microhemorrhages, bronchopneumonia, septic spleen, shock kidney, hepatic fatty dystrophy, excoriated plaques in the head area. The histopathological (HP) examination confirms the macroscopic diagnosis and identifies the presence of calcium oxalate crystals in the kidney tubules. Subsequently, the toxicological examination of the biological samples taken from the corpse at the forensic examination, confirms the presence of the glycolic acid. Postmortem, the investigation conducted by the criminal investigation authorities confirms the oral ingestion of antifreeze. The absence of a positive history, along with alcohol consumption, nonspecific clinical symptomatology and the absence of calcium oxalate in urine are trap elements in the diagnosis of acute ethylene glycol poisoning. The presence of calcium oxalate in tissues, identified through the HP examination, is an extremely important factor when establishing the cause of death. Benign multicystic peritoneal mesothelioma (BMPM) is a rare disease that primarily affects fertile women with previous abdominal surgery. BMPM associated with adenomatous tumor is a single case report, according to our opinion. The patient had a history of abdominal surgery nine years ago for ovarian cysts. Upon admission, the diagnosis was acute surgical abdomen with acute peritonitis signs. The treatment applied consisted in the removal of peritoneal cysts and partial omentectomy. Only immunohistochemical examination established the diagnosis. The aim is to discuss diagnostic and therapeutic difficulties, underlining that there is no consensus on the use of chemotherapeutics. In conclusion, establishing a preoperative diagnosis is difficult if not impossible. One of the causes of acute surgical abdomen may be BMPM. The malignant transformation of this disease is rare, but the disease recurrence rate is over 50%, and it is often recommended to be monitored through abdominal computed tomography. Basal cell carcinoma (BCC) is the most common type of cancer located in the periocular area. We will present the clinical case of a 63-year-old male patient who was admitted to the 2nd Clinic of Neurosurgery, Prof. Dr. Nicolae Oblu Emergency Clinical Hospital, Iasi, Romania, for an ulcerated tumor of about 0.8x0.7 cm in diameter with rolled edges and central necrosis in the upper eyelid with orbital invasion. According to the patient s personal history, he also underwent Cortisone treatment for dermatomyositis. The magnetic resonance imaging (MRI) scan revealed behind the cutaneous flap, a lesion with 15/38/19 mm anteroposterior (AP)/transverse (T)/craniocaudal (CC) diameters. The surgeons made the excision of the tumor together with the eyelid remnants, and the left orbit exenteration defect. The histopathological exam of the surgical samples revealed an ulcerated epithelial tumor having its origin in the eyelid epidermis and invading all the thickness of the eyelid toward the palpebral conjunctiva, but also the orbital tissue. Immunohistochemical studies showed positive staining for cytokeratin (CK) AE1/AE3, CK5/6, and CK17, but not for CK7. The Ki-67 labeling index was 12%, suggesting a moderate proliferative activity. The final pathological diagnosis was mixed (nodular and morpheic) eyelid BCC infiltrative into the orbital tissue. Although BCC of the upper eyelid is a rare cancer and generally has a low recurrence risk, in the case of a patient undergoing Cortisone treatment for an autoimmune disease, the tumor may grow more rapidly by invading the neighboring tissues including orbit. The co-occurrence in the same individual of two numerical chromosomal abnormalities (double aneuploidy) is a very rare condition, especially for autosomes. Clinical presentations are variable depending on the predominating aneuploidy. The authors present a rare case of a male infant with multiple congenital anomalies: craniofacial dysmorphism, short neck, agenesis of the corpus callosum, ventricular septal defect, bilateral broad hallux, large first interdigital space of the toes, plantar furrows, prominent calcaneus and right kidney agenesis. The karyotype identified 82% of mitosis with trisomy 8 (47,XY,+8) and 18% with trisomy 21 (47,XY,+21). The evolution was fatal because of eating difficulties, severe growth retardation and recurrent respiratory infections. He died at the age of five months. 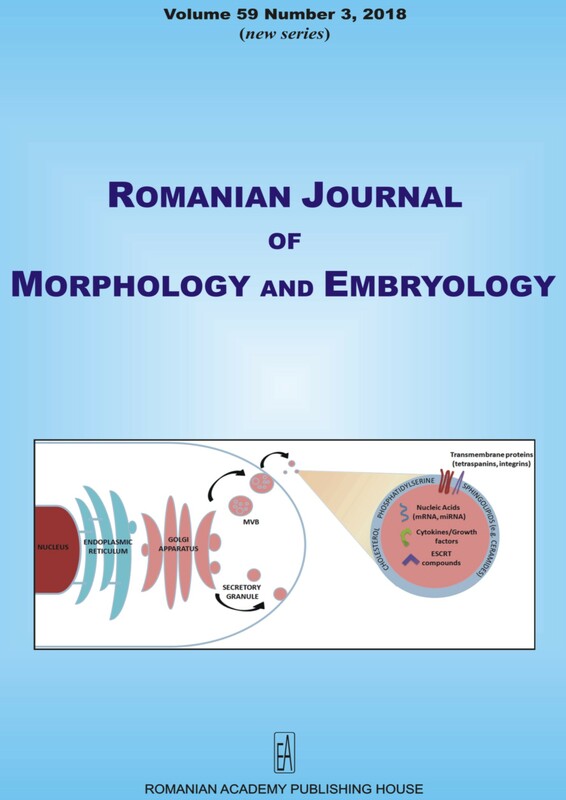 We report this case as a very rare double autosomal mosaicism, with a complete clinical and morphological description, as the first documented case in Romania. 44. Basal cell carcinoma and basosquamous carcinoma, two faces of the same condition? Basal cell carcinoma (BCC) is the most common locally invasive malignant epidermal neoplasm. It is generally a tumor that runs a slow progressive course and can usually be cured by surgery. Basosquamous carcinoma is considered by some authors a rare subtype of BCC, while others describe it as independent tumor with different evolution from BCC. The aim of the study was to present a very interesting case of initially otherwise ordinary BCC that during its repeated and extensive relapses changed its histopathology in a basosquamous carcinoma, despite the free surgical margins and leading to major surgeries with loss of right eye. We present a case of 75-year-old male diagnosed in 2008 with a tumor located in the right naso-orbital region. The patient underwent surgical treatment, the histopathology being consistent with BCC. He presented recurrences of the tumor in 2009 and 2010 that were excised at approximately 9 and 16 months, respectively, from the first intervention. In 2010, the surgical procedure was radical, with removal of the tumor and the entire right superior eyelid. This approach proved to have negative side effects over the right eye in time. Therefore, after two months, a complete exenteration of the right orbit was necessary. The tumor recurred again for three times, after 20, 30 and 42 months from the first intervention and every time surgical treatment was applied. The microscopic inspection of the biopsies showed similarities between recurrences and initial tumor. In 2013, after 57 months from the first intervention, the patient was readmitted with a lesion in the same region that was excised but that time the histopathology differed from the previous, the tumor being composed of sheets of achromic epithelioid cells, with vesicular nuclei and prominent, eosinophilic nucleoli. The tumor cells were positive for pan-cytokeratin AE1/AE3 and negative for S100 protein, human melanoma black 45 (HMB45) and vimentin that sustained the diagnosis of basosquamous carcinoma. The paper presented an interesting case with different histopathological features from a recurrence to other, with important implication in diagnosis and prognosis. The transformation of BCC into basosquamous carcinoma sustain that the basosquamous carcinoma is better a rare, aggressive variant of BCC, than an individual lesion. Compound odontomas are benign tumors, composed of odontogenic tissue that has an orderly pattern. These are formed of unilocular conglomerate of multiple calcified structures, some resembling to mini-teeth. A case of a 9-year-old female patient with compound odontoma is reported, highlighting aspects of odontoma s morphology, clinical findings and treatment. The tumor, found in the anterior maxilla, included multiple calcified structures, some of them resembling to mini-teeth (the biggest were about 5 mm), arranged in a conglomerate. The mini-teeth presented a crown and root, different dental tissues, open apices (the root was incompletely formed), and root canal which was evidenced by usage of Kerr K-file needle No. 8. Their surface presented many irregularities. Odontoma associated impaction of maxillary central incisor, and eruption disturbances and malposition of adjacent teeth. In order to minimize side effects, especially when odontoma is localized in an area with great impact on facial esthetics, early diagnosis and proper treatment are of great importance. Purpose: International regulations regarding the protection of individuals concerning the processing of personal data and the free movement of such data highlight the need for their systematization and customization, depending on the purpose for which they are collected and used. Background: Medical legislation is structured so that the constitutional right to healthcare is guaranteed and at the same time be protected by respecting the right to privacy with respect to identity, physiological state of the person and the way this, by health maneuvers, was restored. European Union (EU) legislation is more and more complex related to the patients right and also to the General Data Protection Regulation (GDPR). After the Second World War, in all Europe the problem related to the human rights become a sensible one in all countries and become aware the importance of clear rules for protecting people, to develop and protect their rights. Content: The article presents the correlation between personal data and intellectual property right in the field of medical research, one of the most dynamic fields of scientific research both in the field of fundamental and applied research. Dissemination of medical information collected through scientific works is subject to the fact that progress in any field should be encouraged, in order to increase the quality of life while, at the same time, creating a balance between the interests of the researcher and the public interest and the interest of the academic community represented by any person in the situation of recourse to a medical service. Conclusions: In the context of the EU guidelines and implementation of GDPR starting to 2018, the medical research and the education of scientific researchers in the field has gone into a new stage of the ethical approach.